Did you know that July is National Ice Cream Month? You do now! On a stick, in a cone. In a cup, a bowl, or floating in a frosty mug of Dr. Pepper… doesn’t matter how you eat it, it has the ability to turn back the “feels like” number on the calendar and the thermometer and has magical cooling powers. Especially when it’s 104 out and you’re lugging 35 lbs of ticked-off toddler around the zoo. I speak from very, very recent experience. We’re big ice cream fans, store-bought and homemade alike. And because you can never have too many recipes, we have a a couple of new ice cream flavors to share with you this month! So let’s get to that Rolo ice cream! Growing up, we didn’t live close to anything. We were almost 40 miles from Houston, right in the middle of no man’s land between two really small dots on a map. When we went to church, it meant we were driving in to Porter (and lunch at the Hot Biscuit!) and when we went “to town,” that meant we were driving all the way to Humble. Going to town meant a stop at the “big” Shell station for gas. And Rolos. Dad was a Rolo junkie. He’d break the roll in two and pitch our half into the backseat where 4 kids were crammed into a spot meant for 3. It was kind of like tossing a bucket of chum into shark-infested waters. 11 seconds later, there was little evidence left aside from a few chocolate smudged smiles and the occasional gold foil shred. When my family was over for one of our weekend “you have a pool, it’s hot, you win” get-togethers, I made Rolo ice cream for Dad. I swirled leftover caramel sauce and leftover fudge ripple (make them once and you’re set – they keep forever) into our favorite vanilla ice cream recipe and added a mountain of chopped Rolo candies. The ice cream was a hit, I barely had enough to eek out a photograph (I would have loved just *one* more scoop). Ice cream shouldn’t have to come with a warning but do make sure that you chop the Rolos into at least quarters – anything bigger and there’s too much hard caramel filling to bite. Vanilla ice cream swirled with caramel, fudge, and Rolos. In a large bowl, add 1 cup cream and set a strainer over top. In a medium sauce pan over medium heat, stir remaining cream, milk, and sugar until very hot. In a small bowl, whisk together the egg yolks. Stream in 1 cup of the hot milk mixture into the egg yolks while whisking. Pour the egg yolks into the sauce pan and heat the custard until thickened, stirring constantly (if you're watching a thermometer, this will happen around 175F). Turn off the heat, stir in the vanilla, and pour the mixture through the strainer into the large bowl. To make the fudge ripple, stir together the water, sugar, corn syrup and cocoa over medium heat until bubbles begin to form around the edges. Let boil for 1 minute, stirring constantly, and then remove from heat. Let cool and then store in a jar in the fridge (will keep for several weeks). The fudge ripple must be completely chilled to use. Pour the custard into your ice cream maker and freeze according to manufacturer directions. Add the chopped rolos and let the mixer run another minute more (or fold them in manually). Transfer 1/3 of the ice cream into the storage container. Drizzle 2 Tbsp each of caramel and fudge ripple over top. Repeat, with the next 1/3 of the ice cream and 2 Tbsp each of caramel and fudge ripple. Transfer the last of the ice cream to the bowl, cover with a lid, and freeze completely. This ice cream looks unreal! LOVE this!! but i love me some rolos! i’ll have to try this out. This looks amazing. I’ve been practically living on ice cream while travelling, with temperatures at 30-35 C! I’d need to buy extra rolos to be sure some made it in the ice cream! Yum! I love rolos and ice cream. I am also a fan of store bought or homemade ice cream. It’s just so delicious. Yah! So excited about National Ice Cream month :). Rolos are seriously one of my favorite candies. I’m definitely making this! I love the way that looks! 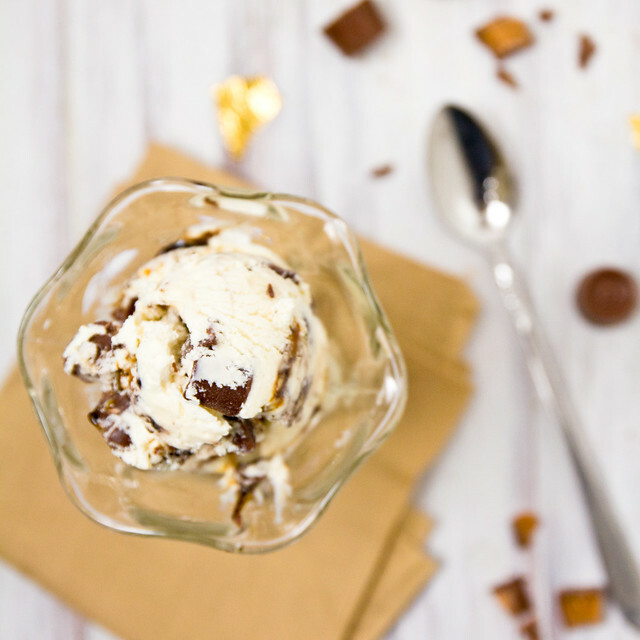 Rolos are one of my favorite candies 🙂 I would love this recipe with even more chocolate–chocolate ice cream! Chocolate Malt Ball Crunch… from Thrifties in California!! (I think this is pretty old school) Our Fav! !